Hello? Can you hear us now? Good — because we’ve got to tell you about National Protect Your Hearing Month. This October we focus on causes of hearing loss and ways to prevent it. Studies show one in five Americans older than 12 have experienced hearing loss in an ear. It can result from work-related noise exposure and leisure activities, such as sporting events or concerts. Since noise-induced hearing loss is permanent, it’s better to be proactive. While you don’t have to avoid all noise, maybe skip the front row concert tickets or opt for quiet “you” time instead. ​The National Institute on Deafness and Other Communication Disorders (NIDCD) started the “It's a Noisy Planet. Protect Their Hearing® (Noisy Planet)” campaign, which targeted those engaged in helping children adopt healthy hearing practices. Its key message? "Turn it Down, Walk Away, or Use Hearing Protection." ​Concerned audiologists formed the National Hearing Conservation Association, which continues to promote the prevention of hearing loss in the general public. ​Disposable ear plugs were patented. Curl up with a book in one of the quietest places you can visit. Trust us, no one wants to be shushed by the librarian. Leave the headphones at home and take in the soundtrack of your neighborhood. Kudos if you decide to hike a trail and hear the sounds of nature. Share tips on how to prevent hearing loss with your friends and family. Take a hearing test together or gift some earplugs to the musicians in your life. ​Even while you sleep, your ears are still at work. The only difference is since you’re unconscious, your brain isn’t processing those sounds you may be hearing. ​These three bones are small enough to be placed together on a penny. ​Earwax helps keep your ears clean so you don’t have to. ​Though they don’t have ears, snakes use their jawbones to identify sounds while fish use ridges on their body to respond to pressure changes. ​If a sound goes higher than our natural hearing limit, all we’ll hear is a buzz. We don’t recommend you try it out. Once you lose your hearing, you can’t get it back. 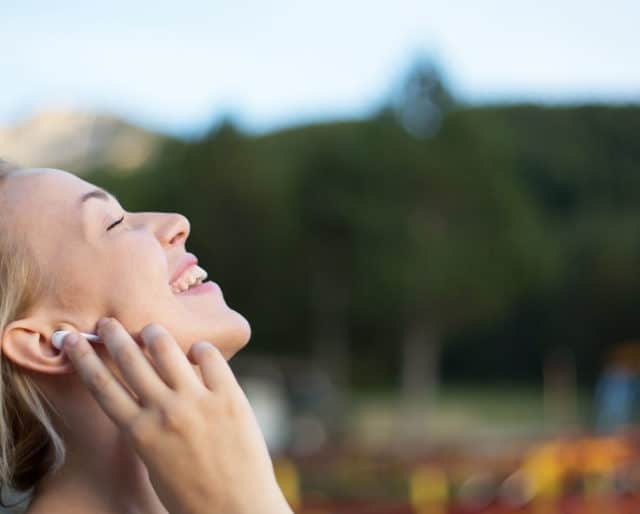 National Protect Your Hearing Month makes us aware that it’s not worth drowning out the background noise. Everything is good in moderation — noise included. With football season in full swing, not attending games isn’t ideal. But, packing a pair of earplugs or adding some distance to the major noise sources makes it safe and possible. We can’t remember the last time we enjoyed a walk to work or the car ride home without music. Your day-to-day has its own daily mix; October is your chance to listen.